Now more than ever, marketers in the manufacturing sector need to play a more significant role in helping their sales teams establish new ways of meeting their quotas and creating new opportunities. 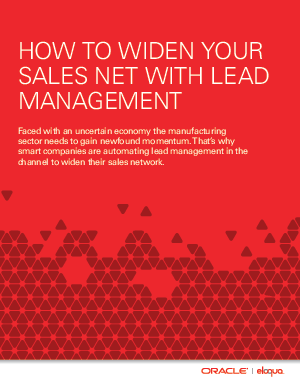 One easy way to do this is by using lead management techniques to widen your territory sales net and generate more new business opportunities through your channel partners, who often lack the sales and marketing resources they need to generate demand. This can be easily managed through automation software, modern versions of which are easy to integrate with CRM and a range of other reporting systems, giving you and all of your channel partners one view of customer data.